Post Title Here	"organic" food, – are we really buying what we think we’re buying? Last March, a third party watchdog group, the Center for Environmental Health (CEH) found dangerous levels of a carcinogen in the caramel coloring of Coke and Pepsi products. The carcinogen, 4-methylimidazole, is a byproduct created during the production of caramel coloring. As the caramel coloring goes under high pressures and temperatures, sugars react with ammonia and sulfites, forming the 4-MEI byproduct. When animal studies showed “clear evidence” that 4-MEI was a toxic carcinogen, including thyroid, liver, and lung cancer incidents, the National Toxicology Program threw up red flags. It was in 2011 that the state of California responded to the lab results, effectively banning the carcinogen from their state. Since then, all cola products in the state of California have been required to be properly marked with a cancer causing warning label, according to Prop 65 consumer protection laws. In the wake of their products being exposed, Coca-Cola and PepsiCo began to change their soda formula for products sold in California. They took an even bigger leap forward when they gave CEH their word that they would not only change their California products, but they would also change their nationwide formula as well, eliminating the production of the carcinogenic 4-MEI altogether. Unfortunately, according to CEH, over a year later, Pepsi hasn’t complied. 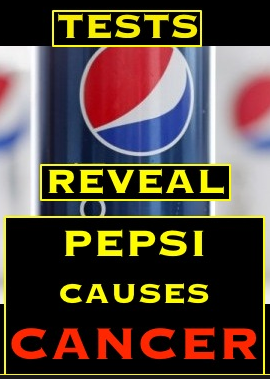 Pepsi purchased from ten states reportedly still contains high levels of 4-MEI, while Coca-Cola has taken drastic measures to rid 4-MEI from their products. You may want to think twice before taking any more generic copies of brand-name pharmaceutical drugs, thanks to a recent Supreme Court ruling that effectively eliminates manufacturer liability in injury cases resulting from negative side effects. In a 5-4 ruling, the Supreme Court recently overturned a $21 million judgment awarded to a New Hampshire woman injured by a generic pain drug, declaring in the process that generic drug manufacturers cannot be sued when the drugs they produce injure patients. Since generic drugs are mere replicas of brand-name drugs that, at one time, were approved by the U.S.Food and Drug Administration (FDA) as “safe,” generic drug manufacturers are exempt from being held liable in the event of injuries caused by harmful side effects. Today’s cartoon is pretty self-explanatory: the mainstream media is very interested in some cries for help, but astoundingly incurious about others. If Obama had a son, he might have looked like Trayvon Martin…but Obama does have an appalling scandal to answer for, and it looks like the bloodbath (and “stand down”) in Benghazi.